Top left: the basic equation of the mathematical model describing signal propagation. Chara algae are ancient plant organisms that are commonly found in freshwater reservoirs and occur, though more rarely, in water bodies with salt water. An unusual feature of this type of algae is the huge size of individual cells, which can reach up to 1 mm in diameter and up to several centimeters in length. This feature makes Characean algae a unique object for the study of intracellular signals, which are associated with the appearance of signaling molecules in some parts of the cell (for example, when they are touched or illuminated) and their propagation to other cell areas. As these intracellular signals propagate, they cause various physiological responses, including changes in photosynthesis and respiration. 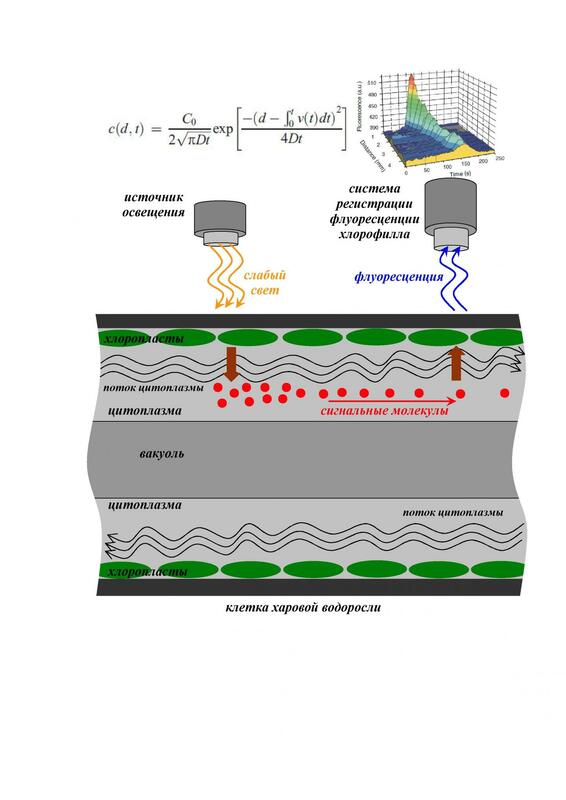 The paper published in the international scientific journal Functional Plant Biology by a research team including Alexander Bulychev and Anna Komarova from the Moscow State University's Department of Biophysics and Vladimir Sukhov from the Department of Biophysics of Lobachevsky University in early 2018, is focused on one of the aspects of the intracellular signaling problem, the role of cytoplasm in the transmission of signal molecules inside the Chara algae cells. It is well known that the cytoplasm that fills the living cells is in a state of an almost continuous motion and only stops moving under stress. The researchers have put forward a hypothesis that such a motion can participate in the transfer of a signal compound within the cell. To test the proposed hypothesis, a small section of the Chara cell was illuminated with low intensity light, which activated photosynthesis processes and enhanced fluorescence in the illuminated zone. Further investigation showed that fluorescence intensification was observed not only in the illuminated area, but also in the dimmed parts of the plant, which were further away from the illuminated zone, in cell regions positioned downstream the cytoplasmic flow. In contrast, the areas upstream the illuminated zone did not change their fluorescence. This result shows that signal molecules formed in the illuminated area even under weak illumination. These molecules propagated with the moving cytoplasm, affecting photosynthesis and enhancing fluorescence in other parts of the alga cell. In the course of additional testing of the proposed hypothesis, an electric current was applied to the cell, causing a temporary stoppage of cytoplasmic streaming. Under these conditions, signal propagation significantly slowed down immediately after the action of the electric current; over time, it reached the initial velocity again. The treatment of Chara cells with cytochalasin, a substance that slows the cytoplasmic streaming, resulted in a gradual decrease in the signal propagation velocity. According to Vladimir Sukhov, based on the experimental results, a mathematical model was developed that describes the propagation of intracellular signal at different velocities of cytoplasm movement. The model also took into account the process of diffusion of the signal compound molecules. "The proposed model describes the experimental results quite well and makes it possible to predict the efficiency of signal transmission under various conditions, including different velocities of cytoplasmic streaming," Sukhov notes. The results obtained by the team are of fundamental importance, since it was shown for the first time that cytoplasmic streaming can play an important role in the transmission of intracellular signals in plants, and a mathematical model is proposed for a quantitative description of such type of propagation. At the same time, the results of this work also have significant applied prospects. Since intracellular signals play an important role in adapting plants to the effects of unfavorable factors, the ability to regulate them provides an additional tool for controlling the resistance of agricultural plants to such factors and, hence, their yield. The data published in Functional Plant Biology show a new potential "application point" for the development of methods to control intracellular signals by regulating the velocity of cytoplasm movement. It is obvious that the implementation of such methods in practice is quite a challenge. To solve this task, one must first make sure that cytoplasmic streaming plays an important role in intracellular signaling not only in Characean algae, but also in agricultural plants that are of the greatest interest from a practical point of view. Besides, one has to find ways to effectively control cytoplasmic streaming in open field or greenhouse conditions. The mathematical model proposed by the researchers can become an important tool for solving this problem: the analysis of this model will enable the prediction of the changes in the cytoplasmic streaming parameters that are necessary to obtain the required applied result.